Babies wearing foxes: is there anything cuter than that? During my last pregnancy, I bought the Oliver+S Lullaby Layette pattern with the heartfelt intentions of making a top in double gauze for my summer baby. My good intentions fell by the wayside when I realized how difficult that would be to sew, and, frankly, when I ran out of mojo after a lot of other baby projects. 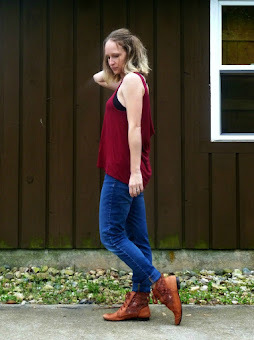 But when it came time for another review for Organic Cotton Plus, I knew now was a much better time to tackle the pattern. OCP has a great selection of cotton prints and solids. I know from past experience that the quality will be amazing (and their shipping is SO fast!). They sell a lot of knits, which is what I primarily sew, but when I order from them I often choose wovens because I know I don't have to worry about quality. I chose a poplin called "Fox in the Foxgloves" and this is the navy colorway. I think the colors are great, kind of boyish but the print is kind of girlish without being TOO girly. It's a good balance. 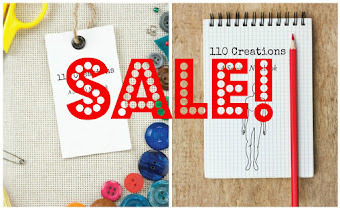 I have a few small scraps left and you better believe I'm saving them for pocket bags! The shirt is a size 3-6 month with 1" of length added to the bodice. Baby M is not quite 4 months old but she's...big...for her age at 18lbs! For reference, H is almost a year and a half old and she's a fairly average 23lbs. On an average sized 4 month old I think the baby would be swimming a bit, which has been my past experience with O+S, that it runs a little large. Or maybe I'm just not used to woven fabrics that need more ease. The top is very cute and the instructions were up to the normal high standard of O+S. The placket was intimidating but if you follow the directions it's fine. I do recommend making a quick practice one, though, if you've never done a placket. 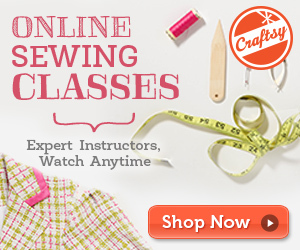 It won't take much fabric and will teach you something new. I did mine backwards because I accidentally cut the placket backwards. My husband frequently complains about buttons on children's clothing (I can't blame him) so I chose to do snaps. The KAM snaps I usually use are size 20 and were too big for the placket, which was disappointing. I opted for sew-on snaps, but sewing them on at the end meant that I could see my stitches. Whomp. I do have smaller set-in snaps from Snap Source, but you may recall how badly that went the last time. The placket is NOT interfaced so I knew those weren't going to work. I ended up hand-sewing a single snap on the placket and taking careful stitches inside the placket so you can't see them from the outside. I may sew another snap on in the same fashion but it was fairly tricky. I should have sewn them on before assembling the placket and that would have hidden all the stitching. The Lullaby Layette pattern also includes a view for a reversible raglan jacket. I've seen these types of jackets before but never sewn one. It was easy enough, just a bit time-consuming since I made my own bias tape from the fox fabric. The brown "outer" layer is from Organic Cotton Plus also and is called "blanket fabric". I know what you're thinking...a coat from a blanket? But yes, I went there! And the fabric is exactly what you'd expect, it's like the world's coziest blanket (and there are other awesome colors like this Very Berry). The weave is loose but not TOO loose to sew. And yes, all my kids wanted it for a blanket the second it came out of the wash. It's very wide, 96", so with my leftovers I do think I'll make a small blanket for the car. The selvedge of the blanket fabric has a portion that is a plain weave, rather than the textured weave, so I played with that edge and made it the edge of the jacket. It was then easier to set in snaps (this portion IS interfaced). I used my KAM snaps here. The "inner" fabric for the jacket is a super awesome heavy flannel. I know what you're thinking...boring! It's definitely not. It's the thickest flannel I've ever felt and the brushed side is very soft. I can think of about 20 uses for my remnants ("Swiffer" cloth, cloth wipes, makeup remover, interfacing, cloth diaper inserts, nursing pads just to name a few). Flannel is one of those fabrics I keep around because I never know what it's going to be good for next. For example, I'm using it as a backdrop behind M for this photo shoot! I'm incredibly pleased with how the jacket turned out because it will be plenty warm enough for winter, and perfect for the car because it's fairly trim. We've been experiencing some unusually warm November weather so even a poplin top is going to see some action right now. And with this quality, it's easily a piece I can pass on to family or friends. And you can see that the hard-to-please baby loves it, she's giving the outfit a thumbs up! 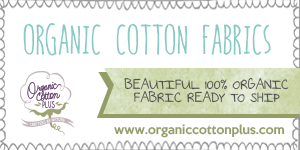 Organic Cotton Plus sent me the fabric in this post for free in exchange for my review, but my opinions are my own. I purchased the pattern. This post contains affiliate links. I love the top, but then - the little jacket! Great job on both pieces, they are ALMOST adorable as that sweet baby. I absolutely love the top and jacket on your daughter! She is adorable! Oh, and I have an almost 4 month old baby who weighs almost 16 pounds, lol!! He's a laidback sweet boy. Introducing A Sewist's Swatch Book!